Grand Falls-Windsor NL – The Western Kings will be representing Hockey NL at the 2019 Major Midget Atlantic Championship being held in Charlottetown, PEI this weekend from April 4-7, 2019. 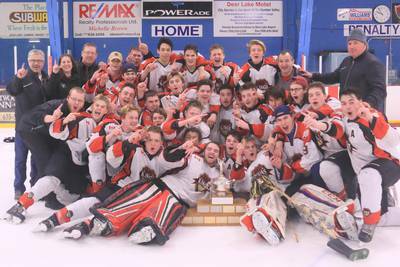 The Kings, who finished third place in the regular season, beat Tri-Pen Osprey in seven games of the finals to claim the 2019 Newfoundland Labrador Major Midget Hockey League title on Saturday night in Deer Lake in front of a capacity crowd. Drew Langdon scored both the tying and game winning goal in the third period and also took home the Presidents Trophy for the top Play-Off Performance. The winner of the Atlantic Championship in PEI will represent the Atlantic Region at the National Telus Cup Championship being played in Thunder Bay, Ont. from April 22-28, 2019. The League, its fans, and Hockey NL would like to congratulate the Western Kings and wish them good luck in their quest to the Telus Cup. The Major Midget provincial league features four teams and showcases the best 15, 16 and 17 year old male hockey players in the province and is a development program for Major Junior and Junior A hockey.